Here’s something unique, original and healthy for your sweetheart. It’s not a bunch of roses, some plush heart pillows or even a poem! You’ve heard that before, and now it’s time to try something new! Squash gives you skills, fitness and most importantly, enjoyment . 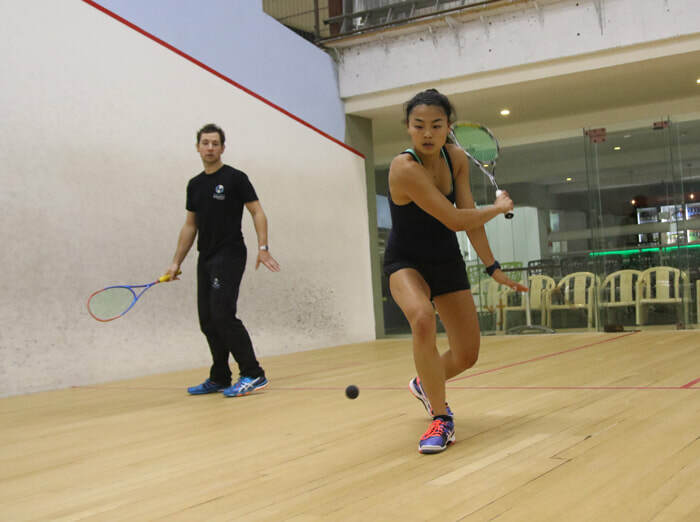 Playing squash improves your cardiovascular health, increases your strength and fitness, burns calories (up to calories 1000/hour), builds hand-eye coordination, and promotes agility, flexibility and coordination. Our squash lessons have been scientifically refined and developed by world-ranking squash stars with international fame, acclaim and recognition. So, our squash lessons are special. Fun. Memorable. And sweet! All lovers are invited… and singletons too. While we aren’t making any promises, you could potentially find your match. So, get your rackets ready and have some fun! We provide squash rackets (so, you don’t have to worry), the rubber ball, and world-class, competition-level courts. Your sweetheart will learn some cool skills and tactics. Why not join him or her by buying additional vouchers? Whatever you decide, you need to be quick. While you can come and play at any time of the year, naturally, the season of love is going to sell out soon! So, forget roses, chocolate, and champagne (they’re cute, but you can do better) and send your sweetheart a gift he/she will remember, and most importantly enjoy. East Coast Squash Academy's Small Group Classes can help you develop a passion for Squash as a novice. Our classes can harness what you learned as a beginner and hone your skills to take on more experienced players. And finally, the Small Group Classes can help advance your game to take on the elite opponent. With a maximum of 8 Beginners and 6 Intermediate/Advanced players per classes, on 2 courts, you are sure to get plenty of time training with your coach. For more details please click "HERE"
The classes are designed for 2 players so everyone gets personalised attention. You can choose a time and location that best meets with your convenience. You can work with your coach on a specific aspect of your game which needs improvement. Your coach will devise lessons aimed at the area you and others want to focus on and work to make sure that everyone gets their desired outcome from each lesson. For more details please click "HERE"
Each session has been deliberately kept to 1.5 hours, allowing enough time for coaching as well as practicing what you learn. With a limit of 8 players at any given time and two courts, you will receive the individual attention required to correct your strategy approach as well as observe others and learn from their mistakes. For more details please click "HERE"
Give your sweetheart a gift he/she will remember!